What is the FIFO Method? 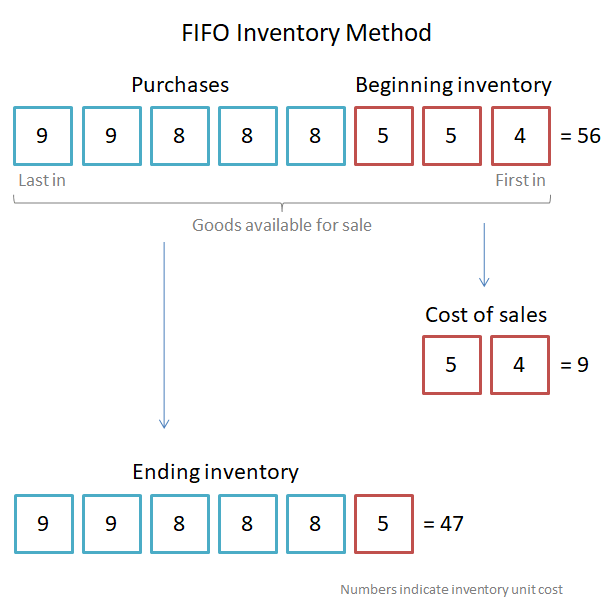 The FIFO method (First In First Out) is a way of determining which items of inventory have been sold during a period and which items remain in inventory at the end of the period. This will allow a business to determine the cost of goods sold and the value of the ending inventory. A method is needed because all items are not purchased at the same price. The FIFO method assumes that the goods are used in the order in which they were put into inventory. It should be noted that it is not necessary for the business to physically use the goods in this order only to value it based on that assumption. The FIFO method is summarized in the diagram below which shows the sale of two units. The number inside each unit represents its cost price. Using the FIFO method the two units sold are the first in, which in this example are part of the beginning inventory. The FIFO method used in this example is demonstrated in the tables below. The first table shows the movement in units. The items sold comprise 100 of the 5.00 units and 100 of the 5.50 units. It also shows that because the beginning inventory has all been sold, the remaining ending inventory is all 5.50 units. This table converts the units in the table above to values at either 5.00 or 5.50 per unit. The FIFO method is one of the available methods used in inventory management. Clearly the method used to determine which units are sold and which remain in ending inventory determines the value of the cost of goods sold and the ending inventory. As profit depends on the cost of goods sold, the method chosen will affect the profits of a business. Other methods of determining inventory movements included LIFO (last in first out) and Average Cost.